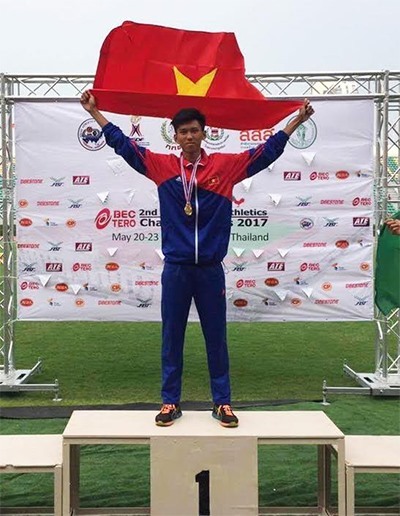 HÀ NỘI — Cao Võ Ngọc Long of Việt Nam won a gold medal at the second Asian Youth Athletics Championships’ high jumping event in Thailand on Monday. Long, 17, displayed an impressive performance in the category, which saw many athletes, including title favourites Qihao Sun of China and Hussain Nasser Alshawakir of Saudi Arabia. After his first attempt of 2.05m, Long was ensured of a gold medal as Sun’s best result was 2.03m after three jumps. Under coach Nguyễn Duy Bằng’s guidance, Long raised the height and reached his best of 2.10m to top the podium at the National Stadium in Bangkok. Sun came second and Alshawakir was third (2m). It is a new national record for the youth. The previous record was 2.08m, set by Nguyễn Thành Nhân in 2013. With this result, Long gets a ticket to participate in the International Association of Athletics Federations’ World U18 Athletes in Nairobi, Kenya, on July 12-16. It is Long’s second gold medal for the year. He earlier won the title (2m) at the ASEAN Age Groups Athletics Championships in the Philippines in March. Coach Bằng believed his national record of 2.25m would soon be overtaken after watching Long’s progress. It took Long only two months to lift his result by increasing the height by 10cm. In Bangkok, Việt Nam also won two silver medals. Đoàn Thu Hằng came second in the women’s 3,000m with a time of 10min 2.18sec. Choe Il Gyong of North Korea bagged the gold (10:00.96). Indian Seema finished third (10:05.37). In the women’s high jump, Nguyễn Lan Anh pocketed the second gold for Việt Nam with a result of 1.69m. Marya Mabdulhameed Abdulelah of Iraq came first with 1.73m and Olga Shlentova from Uzbekistan was third, jumping 1.69m, as high as Anh but needing more attempts to conquer this height. After three days, China are on top with 12 golds. Chinese Taipei (five) and India (four) are second and third, respectively. Vietnamese athletes will compete in the women’s 400m hurdle and women’s and men’s 2,000m steeplechase events.